in Garter stitch, unblocked. Gauge is not critical. 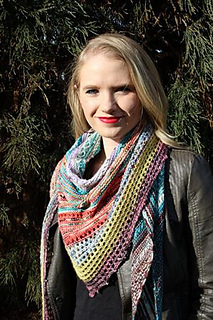 Welcome to the 2017 Semi-Precious Tosh Shawl MKAL! Over the next 12 months, we will be knitting a shawl using the monthly limited edition Semi-Precious Tosh colors available from Jimmy Beans Wool. 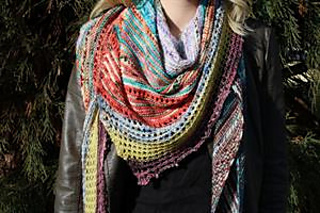 You will need 70 yards of each color, and at the end of the year you will have a large, cozy shawl of many colors! 70 yards a month isn’t much to knit, so the slow pace of this project will adapt to your busy life, or other knitting and crafting commitments distractions! 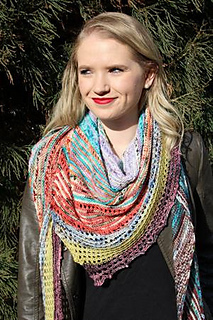 If you would like to knit the shawl in the Semi-Precious Tosh colors, you can purchase a kit for it from JBW here! Each month, I will release a clue, with the latest set of instructions, incorporating the next color in the sequence. 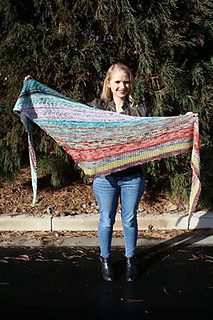 You will receive a Ravelry message, as well as an email letting you know the clue is ready to download. It will be around the 15th of the month, coinciding with the release of the Semi-Precious Tosh color from Jimmy Beans Wool! By the end of the year (if you keep up!) 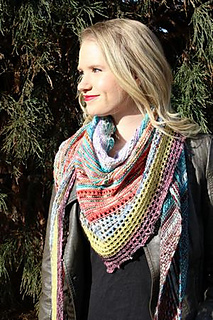 your shawl will be complete!